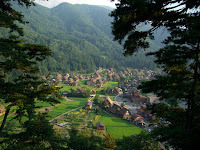 I visited 白川郷 (Shirakawa-go, Japan) for the first time on 04-06 August 2006 in company of 明日香 (Asuka) to discover this UNESCO world heritage famous for its unique houses built in 合掌造り (Gassho-zukuri) style. We relaxed two days in the village, including an excellent dinner and a refreshing night in a traditional house. The weather was extraordinary all along and, far from the big cities, we appreciated the whispers of the wind and the songs of the insects.